What Are Cloves and How Are They Used? Cloves are a pungent spice found in savory dishes, desserts, and drinks. Ground or whole cloves flavor meat, sauces, and rice dishes. Cloves are often used along with cinnamon and nutmeg in sweet dishes, especially "pumpkin pie" flavored items for the autumn and winter holidays, and in drinks such as mulled wine, cider, or chai. Cloves are a spice made from the flower buds of an evergreen tree called, appropriately enough, the clove tree (Syzygium aromaticum). Clove flower buds are harvested in their immature state and then dried. Whole cloves are shaped like a small, reddish-brown spike, usually around 1 centimeter in length, with a bulbous top. Cloves can be used whole or ground, and they have a very strong, pungent flavor and aroma. Cloves are grown in India and Madagascar, but Indonesia is most closely associated with the production of cloves. Indeed, so lucrative was the clove trade originating in an island chain once known as the Spice Islands (now part of Indonesia), that in 1667, following the Second Anglo-Dutch War, the British ceded the islands to the Dutch in exchange for a faraway settlement then known as New Amsterdam. Thus did the Dutch swap Manhattan for cloves. 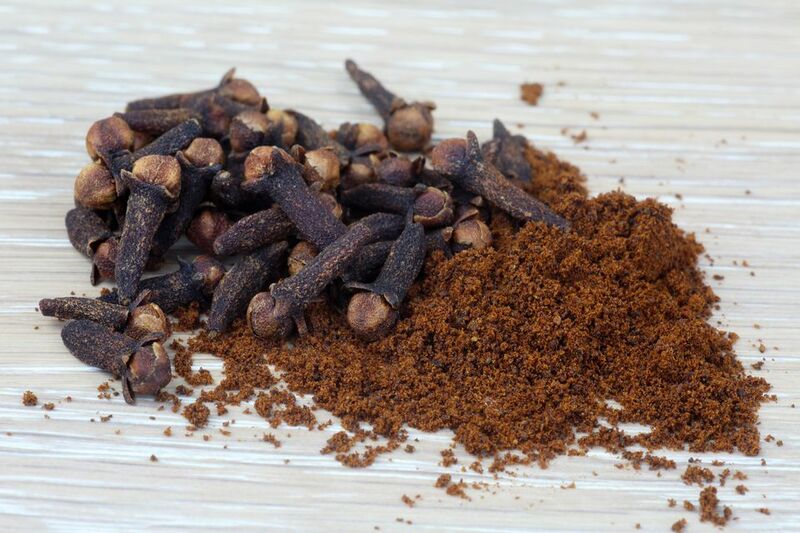 Cloves are a pungent warm spice with an intense flavor and aroma. The flavor comes from the compound eugenol. On the tongue, you'll detect sweetness, bitterness, and astringency (drying the mouth), with a noticeable amount of heat. Similar warm spices include nutmeg, cinnamon, and allspice. These are often combined in a pumpkin pie blend. Cloves are much more powerful than these more-tepid flavor cousins and therefore less is used in a recipe or blend. Some people find the flavor of cloves overwhelming and choose to leave this spice out entirely. Whole or ground cloves are used to flavor sauces, soups and rice dishes, notably a number of traditional Indian dishes, and it's one of the components of garam masala. Whole cloves are either removed before serving or picked out of the dish. Even when cooked, whole cloves have a very hard, woody texture that would be unpleasant to bite into. Cloves also feature in any number of desserts, especially ground cloves, and particularly around the holidays. Think eggnog or pumpkin pie spice. Cloves are often paired with cinnamon or nutmeg, but in general, it's a good idea to use cloves sparingly. Cloves are often found studding a holiday ham, in Indian biryani dishes, or in pumpkin pie spiced drinks and desserts. It is also one of the key spices used in making the classic béchamel sauce. Buying whole cloves, you can easily produce ground cloves when needed. This is desirable because ground cloves, like any ground spice, will quickly lose potency and depth of flavor. You can use a spice grinder, mortar and pestle, or a clean coffee grinder you designate for this purpose. Be sure to clean the grinder well afterward before you use it with other spices as the clove flavor and aroma will linger. If you don't have cloves, a quick substitution in a recipe is an equal amount of allspice. Or, make a blend of nutmeg and cinnamon (equal amounts of each) as a clove substitute. A common non-culinary use of cloves is the kretek clove cigarette produced in Indonesia. The essential oil is used in aromatherapy for stress relief. In the traditional medicine of non-Western cultures, cloves are used in Indian Ayurvedic medicine and Chinese medicine as a warming and stimulating substance. Cloves can be found in small jars in the spice section of the supermarket. You will see both whole cloves and ground cloves. But you might be able to find them offered for a lower cost in the Hispanic food section, where they are labeled as clavos de olor, or simply clavos. International grocery stores also often sell cloves for far less than you will them in the supermarket. Some specialty markets offer Penang cloves, which are gourmet cloves that are individually selected by hand to ensure that each one is flawlessly shaped. Cloves should be stored in an airtight container, preferably in a cool and dark place. Whole cloves will retain their potency longer than ground cloves, remaining fresh for about a year compared with three months for ground cloves. Cloves have long been used in home remedies to treat for toothache pain. The eugenol that provides the flavor of cloves is also a pain-reliever and can help relieve inflammation. Look for clove oil (or oil of cloves) in the tooth care section of a drug store. Be aware that it can be toxic for children, so keep any clove oil out of reach and use only child-safe, diluted preparations on children. Read the directions carefully and consult your dentist or pediatrician if you have any doubt as to the safety.